… it is something strictly American to conceive a space that is filled with moving, a space of time that is filled always filled with moving. I just came across an interesting discussion in the New York Times, triggered by a column in the Times Magazine on April 29 by Dan Kois called “Eating Your Cultural Vegetables”, responded to by the Times’ two chief film critics, A.O. Scott and Manohla Dargis, on June 3, then followed up again with a three-way exchange between Scott, Dargis and Kois on June 17. The issue was Kois’s trying to come to terms with the fact that he doesn’t enjoy a lot of “art films” that he feels he ought to appreciate in order to maintain some sense of cultural seriousness. What I find interesting is the set of terms with which this debate has been framed, terms apparently shared by all involved, even the many readers who have posted comments in response. Those terms are highlighted by the headline attached to Scott’s and Dargis’s initial response: “In Defense of the Slow and the Boring”. Everyone involved uses those terms to describe “art films”, terms which play into Kois’s initial analogy by which he designates these films “cultural vegetables”, things not pleasant in themselves, but to be consumed because they’re “good for you”. (Which raises the question, what exactly is wrong with “vegetables” anyway?) This terminology is so freighted with implications that it inevitably reinforces an underlying presumption that such a dialogue has no choice but to accept the ideology of the commercial movie marketplace as a given, that there is indeed some objective category named “entertainment” and that that category is defined by a certain set of characteristics which emphatically do not include seriousness, or a conscious intention to convey meaning. This presumption of superficiality doesn’t get applied to other areas of creative endeavour — to painting, sculpture, music, literature — in fact in most of the other arts, the opposite assumption rules: prolonged and repeated contemplation is needed to prise out all the complex meanings in the work. But film has struggled with this issue since the medium’s invention, the tension between art and mere diversion, and given the amount of money necessary to create a movie, the commercial interests which fund production have worked hard to suppress the idea of “art” because it interferes with the fundamental tenet of consumer capitalism: the constant offering of new products to replace what has come before. If audiences are encouraged to pause and contemplate a particular movie then they won’t be ready to move quickly on to the next. The “boredom” which Kois, Dargis, Scott and the Times’ readers speak about so glibly is rooted in the mindset with which audiences have been conditioned to approach such “slow” films. If one looks at a film as something to be merely consumed rather than experienced, something to take in passively rather than to engage with actively, then a movie which demands the viewer’s engagement might seem “boring” simply because it doesn’t easily give up its meanings; or rather, those meanings are not just handed to the audience, they emerge through the active interaction of the viewer with the film. 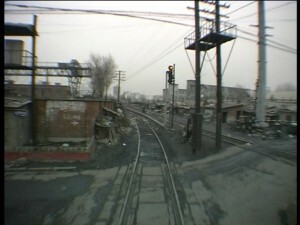 Wang’s magisterial documentary functions in ways similar to the work of other “slow” directors, people like Andrei Tarkovsky, Bela Tarr, Theo Angelopoulos, Michelangelo Antonioni, Terrence Malick … and, yes, I’m aware that this list consists mostly of “foreign” filmmakers, directors who have not been constrained by the Hollywood commercial model. 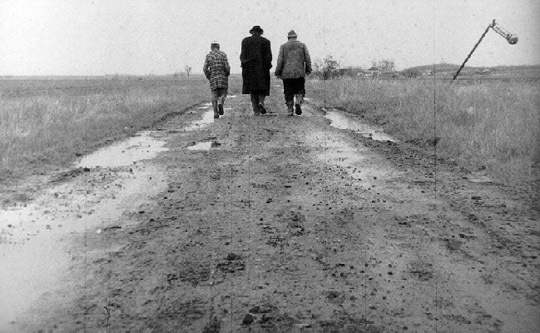 One of the key things which distinguishes them from their Hollywood counterparts is their desire to slow things down so that the viewer actually takes time to see the world which is being shown (the work of all these directors possesses a remarkable sense of physical presence), rather than to rush through it using those classic Hollywood techniques which try to make a movie so self-contained, so hermetically sealed in a world of its own making that the viewer is instead discouraged from contemplating any larger reality outside the frame. 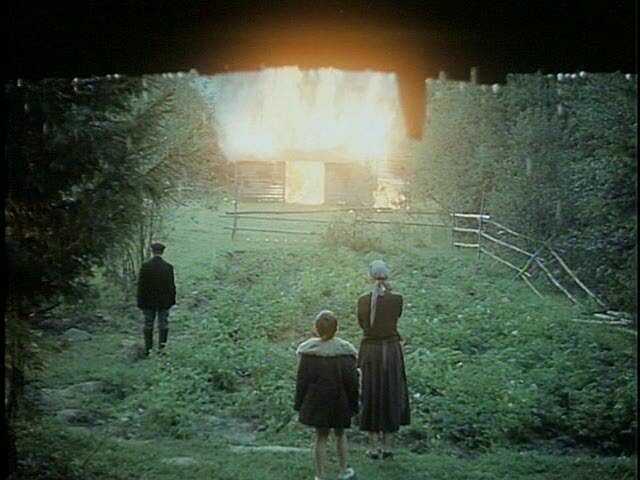 This can work in simple ways – the shot early in Tarkovsky’s Mirror, for instance, in which we see a gust of wind made visible as it sweeps across an open meadow of tall grass, a shot which is breathtaking both in its simplicity and in the way it suddenly makes the viewer attentive to the natural forces which surround us and which are so familiar that we generally take no note of them. In a more complex way, this issue of “slowness” makes us aware of the difference between time and duration, between the inexorable external physical forces that carry us along and the subtle, unstable inner experience which is the only way we can actually know those forces. Time is a physical fact; duration is a subjective impression. 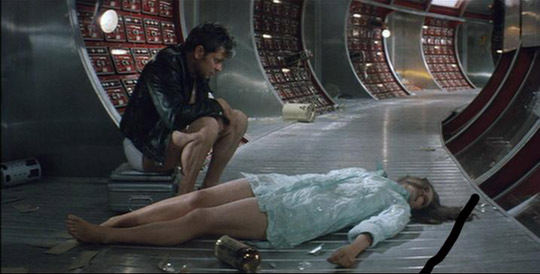 Case in point: Tarkovsky’s Solaris is 165 minutes long, while Steven Soderbergh’s remake is only 99, yet Soderbergh’s movie seems interminable to me while Tarkovsky’s floats by with little sense of time passing. 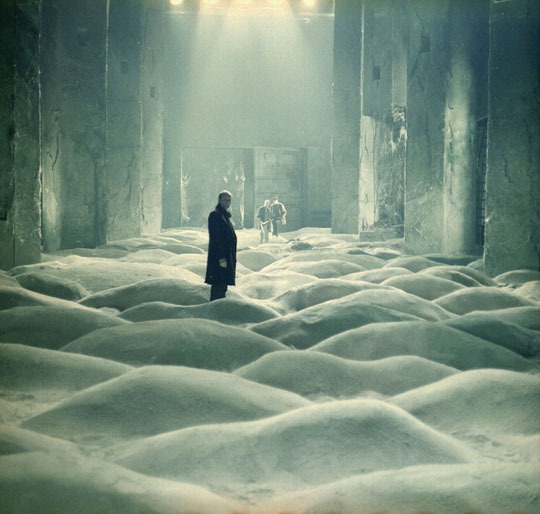 A result of the fact that Tarkovsky’s imagery and editing strategies draw me into the world he has created, while Soderbergh’s seem vapid and empty. “Boredom” is surely not a function of pace and duration, then, but rather a question of the degree of engagement one feels with the film. I’ve seen ten-minute movies which felt as if they’d never end and 9-hour movies that I never wanted to end. In every case, the response depends on a complex interaction between my own experiences, past history and expectations, and the creative choices made by the filmmaker. If I’m engaged, time ceases to matter; if I’m not engaged, time is a terrible burden. This idea that a slow pace is a problem derives from the delusion fostered by contemporary commercial filmmaking that equates constant visual and auditory stimulation with excitement. But, really, is there anything more tedious than the Pirates of the Caribbean and Transformers movies which offer nothing but visual stimulation, with nothing to engage on a narrative or emotional level? 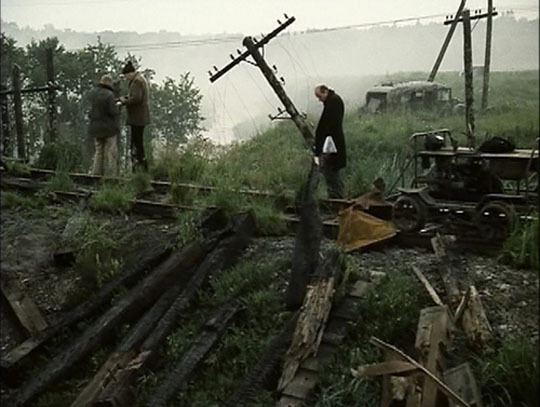 Years ago, I was watching Stalker — which I consider to be Tarkovsky’s masterpiece — with several friends. After the opening section which introduces the characters and their bleak world, there’s a crucial sequence in which for several minutes we watch the three men’s faces as they ride the rail car into the Zone, the only sound the clacking of the wheels. 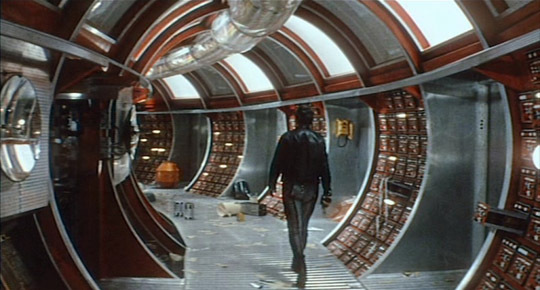 I say this sequence is crucial, because if it doesn’t work on the viewer as intended, nothing else in the film will work; the pace and rhythm of the sequence serve to adjust the viewer’s perception to a different sense of duration, a slower pattern of thought which will open perception up to the complex combination of physical and symbolic factors within which the narrative will be played out. 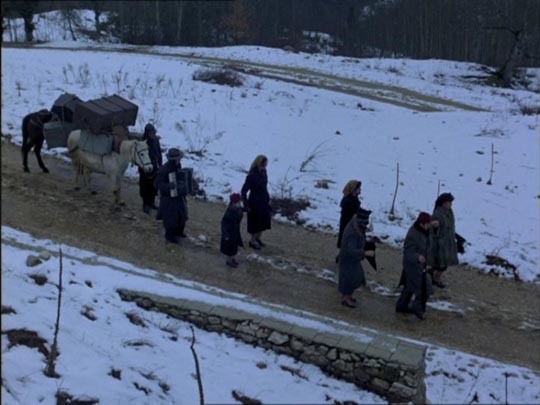 I’ve always found this sequence enthralling, almost mystical — yet that day, one of my friends suddenly said, after a minute or two, “okay, Andrei, we get the point, let’s move on.” And of course, in saying that, he revealed that he had completely missed the point and the film was simply not going to work for him. Quite obviously, Kois wasn’t open to that particular experience. In Blue, Jarman created a remarkably subtle and complex meditation on his own growing blindness as he dealt with the final stages of AIDS. Far from “79 minutes of narration”, he constructed a dense, devastating, multi-layered soundscape completely devoid of self-pity, through which he conveyed every nuance of his experience of the loss of sight. 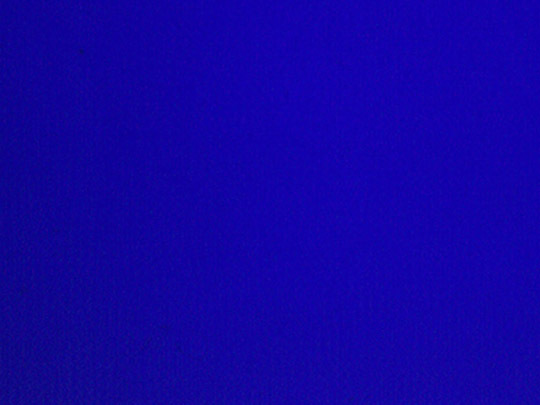 You might ask why he didn’t simply leave it at that and offer it as a listening experience; but the brilliance of the film lies in his use of that “unwavering deep blue” screen, because through that device he managed to convey to his audience the psychological experience he was speaking of in the soundtrack: when you sit in a dark room and stare at that blue screen, it quickly fatigues your optic nerves and, through the resulting visual sensory deprivation, gives you, if only briefly, a sense of blindness. In this state, you become more acutely attuned to what you hear on the soundtrack, your imagination stimulated to conjure up a rich, subjective visual experience. 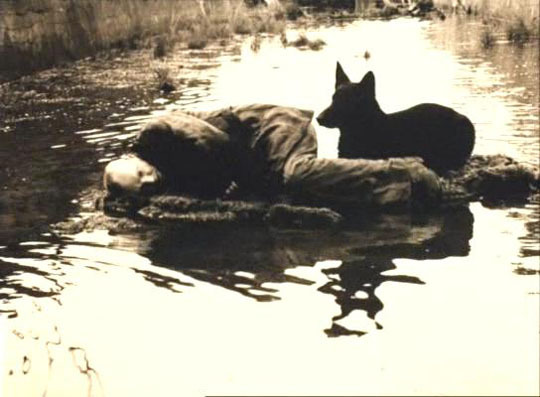 Somehow, Jarman had hit on a way to convey viscerally to an audience the essence of his own experience — and that’s the key to the film, that it is something that is experienced on a physical as well as intellectual and emotional level. At least it is if you’re open to what Jarman is doing. Boredom, then, doesn’t arise from something intrinsic within any particular film, but rather results from the interaction between the film and a viewer’s interests, tastes and expectations. But don’t get me wrong; I also like a “good story”, well told (of which, unfortunately, there seem to be fewer and fewer in commercial filmmaking). But why should we have to choose one or the other, and why do so many people feel the need to attack those who choose one over the other? The exchange in the pages of the Times is a rather more polite version of what goes on in the comments sections of websites like Rotten Tomatoes, where people are always ready to take personal offence when someone else doesn’t share their opinion of something. This is apparently rooted in an insecurity which fears that others will judge you for your likes and dislikes, and what seems to be a sneaking suspicion that people who claim to like this kind of “arty” stuff must feel superior to ordinary folk. While it’s only natural that we want others to like the things we like, and to think that they ought to dislike the things we dislike, there should be room for many different forms of film to exist simultaneously, to satisfy the widest range of tastes and opinions … it just seems ironic, given how these “art films” make up such a small piece of the market, that they elicit such aggressive negative opinions from so many people. Still, there’s nothing inherently wrong with sticking to the things you like and avoiding the rest — other than closing off a lot of possibilities which might actually enrich your experience. This entry was posted in Commentary and tagged A.O. 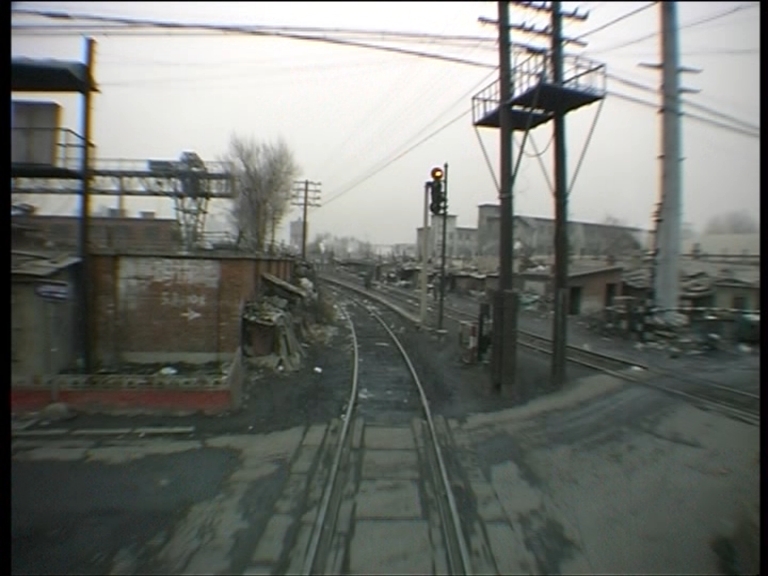 Scott, Andrei Tarkovsky, Art Film, Derek Jarman, Manohla Dargis, Wang Bing. Bookmark the permalink. They inspire nothing in the viewing audience except suspicion in anything that they can’t easily understand and or identify with. Maybe film criticism is like all other intellectual pursuits in our culture, a screaming drive to the middle loudly backed up by the monotonous noise of the internet. That not only are you wasting your time by watching them but you are losing precious hours of your life to them. Your explanation about boredom is truly right; how it is not inherent to the product but rather an active perception. After all, the thing is to enjoy what your sensibility allows you. The majority of people who hate “art films” mostly don’t have (or don’t want) to open themselves and let their empathy drown in the film they are seeing. Nonetheless, this doesn’t mean every film pretending being an arty one (trying to be deep artificially with long takes, or eccentric elements) has to be necessarily a masterpiece as some phony hipsters may do, but the truth is that the majority of mainstream public prejudges artistic films because they hardly understand them, so they find easier to accuse their minoritary public as pedantic people instead of making a mental (and emotional) effort to understand it. Ah, and the part where you tell your experience with your friends while you were watching Stalker made me laugh because that is the same way I feel too. There are people that seem to have an armor that they are afraid to break because they could see inside of them, maybe. This phenomenon is more pressing when seeing horror movies, too, when people start laughing every moment they feel nervous just to avoid confronting the film with sincerity -as this allows you to be truly scared at the same time you will enjoy it at the maximum level as a rewarding emotional experience-. Thanks so much for your article. It’s so good to hear someone making the point that this way of talking about movies is taking this single-sided mindset as a given, as if we can all agree that hollywood is not boring. For me, it’s always been the opposite, hollywood, and especially the stuff made nowadays, including quote on quote indie films, are beyond boring.